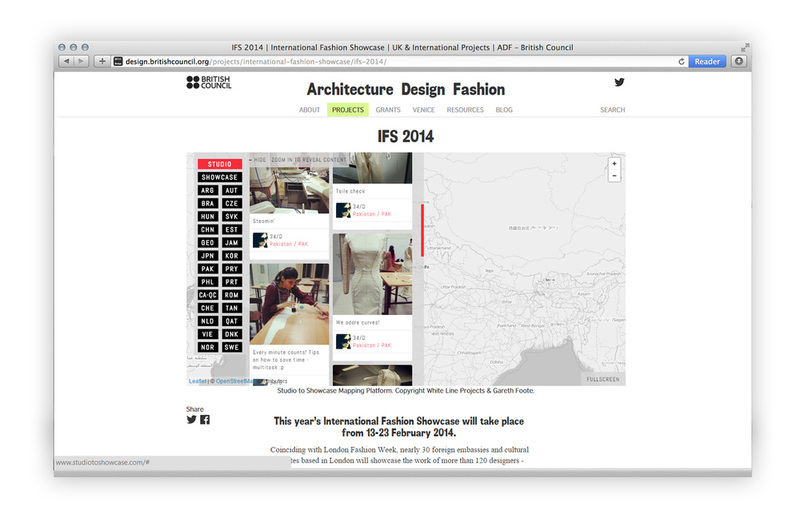 White Line Projects were commissioned by The British Council to curate and develop an online mapping platform for the International Fashion Showcase 2014, their annual collaboration with The British Fashion Council. Created in collaboration with developer and technologist Gareth Foote, the digital mapping project, Studio to Showcase, traced the experience of the designers from their studio to showcasing during London Fashion Week. Based on social media posts (Instagram and Twitter), the interactive map captured the designer’s voice, revealing how their cultural context informed their work, all within one single online platform. The map also accommodated for the visitor’s response to the London showcase.